It's been a big week at Mountain Goat, monumental some might say, with the ripples sure to be felt for a while longer. But whatever the takeover by Asahi ultimately means, when it comes down to it, Mountain Goat has been in the business of making beer for 18 years and will continue to be in the business of making beer. 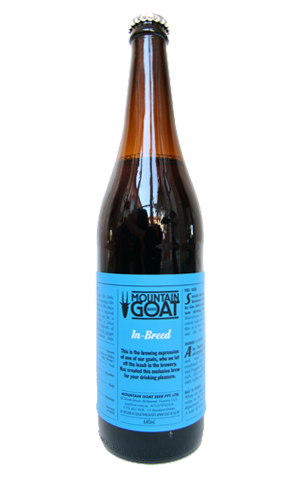 One of those making beer there for longer than most is Naz, or Shane Edwards to his mum and dad, who joined as a pizza maker and barman before leaping across the floor to the brewery at the start of the period during which Goat has enjoyed its greatest growth. He's brewed a couple of keg-only Nazes (or should that be Nazzes?) before, which took the form of a mocha porter and an "even crackinger" mocha porter. This time around, however, his beery alter ego is getting the In Breed bottle treatment. He's come up with a different beer, albeit one that again favours malt over hops: a Scotch ale. And, fittingly for a beer inspired by the land of the battered Mars Bar and tablet, it's one for the sweet-toothed. A blend of chewy specialty malts creates a deep brown brew that's a veritable Highland coffee shop dessert trolley laden with toffee, clotted cream, cake batter and raisins, all wrapped up with a toasted nut finish. Och aye, laddie, it'll put hairs on your chest (and possibly an inch on your waist).